The Latin word forensis means "public discussion or debate" in Latin. When you combine forensics and science, you get the practical application of science to matters of debate, which in modern times translates to the law. Forensic science can prove the guilt or innocence of a defendant in criminal law, and it can help resolve a broad spectrum of legal issues in civil actions through the identification, analysis, and evaluation of physical and other evidence. But an accurate forensic science definition extends beyond the traditional concept of science. It can include the areas of accounting, psychological testing, and interpretation of data and other evidence. Forensics can include DNA analysis, fingerprinting, autopsies, pathology, and toxicology in the scientific sphere, all of which can be used to determine the cause of death and to link a suspect to a crime. Forensic scientists and law enforcement officials use cutting-edge scientific techniques to preserve and examine evidence in a process known as "chain of evidence." This process ensures that evidence is pure and has not had an opportunity to become tainted through mishandling. Keeping meticulous records allows forensic scientists to show exactly who was in possession of evidence at any given time and when and how transfers of the evidence were made. Forensic science can also involve an analysis of electronic or digital media—think wiretaps and recovering "erased" information from computer hard drives. It might mean an exhaustive reconstruction of business or financial records to track sources of hidden income or expenses, or psychological profiles and evaluations of those involved in crimes or a lawsuit. A forensic scientist is typically charged with much more than just digging into the facts of a case and substantiating or disproving them based on an interpretation of the evidence. Strong record-keeping skills are crucial because he will often be called upon to testify to his findings in court. Such scientists are typically required to submit written reports to the court and opposing counsel as well, detailing the nature of their findings and testimony before trial. These reports can be extensive and complex. A forensic scientist must be able to demonstrate how he arrived at his conclusions. A forensic scientist often serves as an expert witness at a trial. He isn't a party to the incident that gave rise to the lawsuit or criminal trial and he can't testify to the facts of the case. Rather he testifies to his interpretation of them. He has the training and credentials to pose an opinion regarding various aspects of the case. The opposing party reserves the right to cross-examine and challenge the forensic scientist's findings. One challenge might be that he might have processed physical evidence incorrectly. Forensic science includes a good many general jobs, but positions in this field also cover a broad spectrum of specialties. You can pretty much match any one of them to your area of interest and expertise. Blood Spatter Analyst: A blood spatter analyst is charged with analyzing blood samples both at the scene of a crime and in the lab. This type of analyst can also work with trace evidence. Document Examiners: Think issues of handwriting analysis here. This position can also involve detection of altered images and print copies. Forensic Anthropologists: Similar to medical examiners, forensic anthropologists deal with human remains to derive information such as the age or race of a victim. In fact, they typically work under the supervision of a medical examiner. They're less likely to work with recent corpses than bones and other remains, however. Medical Examiner: The position of medical examiner pays very well but it also requires a good bit of schooling—you must have a medical degree in addition to a four-year degree and additionally complete a residency. This position involves conducting autopsies and determining a cause of death. 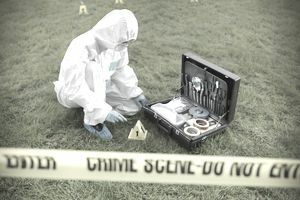 Forensics Technicians: Forensics technicians are often employed in the field to collect evidence in such a way as to preserve the chain of evidence. Forensic Accounting: Another less scientific area that you might want to explore is forensic accounting. If secrets hidden in numbers intrigue you, this position involves digging for evidence in financial records. Forensic Engineering: Forensic engineering might be for you if structures and their anomalies are what get your blood pumping. Forensic Artists: Many detectives and investigators do double duty to accommodate this role, but some larger law enforcement agencies have artists on staff. They can create composites based on witness testimony as well as age progression images and other visual aids for trial. Laboratory Analyst: The range of evidence handled by a laboratory analyst can be more complex, stretching to collecting DNA evidence and performing analyses of weapons as well. Toxicologists: Toxicologists investigate blood and tissue samples for substances such as alcohol, drugs, or even poisoning. Both laboratory analysts and toxicologists typically operate out of labs, as do fingerprint analysts and ballistics analysts, who work with solely with firearm evidence. A career in one of these sciences generally requires at least one four-year college degree in one of the natural sciences, most commonly in the forensics field that you wish to pursue, but there are exceptions. An accounting degree is typically necessary if you want to engage in a field of financial analysis. Pathologists, on the other hand, must first earn a medical degree and doctors of osteopathic medicine (DOs) must additionally be certified by the American Osteopathic Board of Pathology. You might consider a broader major like criminal justice if you haven't yet pinned down your exact area of interest. A secondary degree specifically in forensics can help you get your foot in the door. And some entry-level positions might simply require former law enforcement experience—you can learn more on the job. If you have an inquiring mind and like to advocate for the truth, forensic science may be the career for you.